Happy Independence Day! Today, we remember that 238 years ago, a few good men banded together to throw off the yoke of tyranny and proclaim for all time that all men are created equal. That day, they turned the chapter in the history book of humanity into the age of free men and women living in free societies. From that moment, the promissory note that was the Declaration of Independence and Constitution has been the guiding force of the conscience of this great nation. We expanded our territory to encompass most of North America, extending the same promises of freedom, life, and liberty to all people’s within those areas. Next, we fought a great war against our own brothers so that we might make good on the promise of freedom to people of color, who for so long had not been allowed to enjoy the protections of our Constitution. In the 20th century, we twice sacrificed hundreds of thousands of our children in world wars so that the liberty we enjoy might not be extinguished from this earth and so that we might also destroy evil upon it. Today, we must recommit ourselves to the thought that allowed our forefathers to accomplish such great tasks in the name of free men and women. We must understand that America is not just a nation. America is an idea. The idea that the natural rights of man- life, liberty, and the pursuit of happiness- must be respected by the governments of man. The idea that the government of man must be of, for, and by the people. The idea the people, each and every man and woman, are set loose by the promise of freedom to build themselves into the great individuals that Almighty God intended them to be. The idea that freedom and justice are the entitlements of every single one of us. Yet, even now, when we have defeated so many foreign tyrannies that would seek to destroy these ideas, we are again in danger of losing them forever. The men we have elected to champion the idea of America are not doing so. They are destroying us on the world stage and corrupting the entrepreneurial spirit of the average American at home. As President Reagan so eloquently said, “Freedom is never more than one generation away from extinction.” This July 4th, our nation is headed full speed ahead into that path of oblivion. We can, we must, stop it. So, my fellow Americans, remember the idea of America today. Stand up and fight for this “shining city upon a hill” so that the beacon of freedom may not be extinguished in our time, so that we will not tell our children what it was like to be free, so that we may restore America! 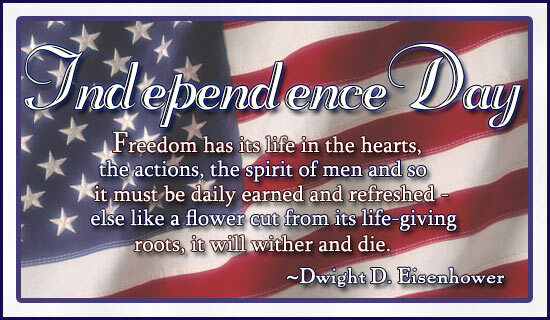 Happy Independence Day and God Bless America!